Karen Bassett is one of Britain’s top carriage drivers and has completed as part of the British Team on numerous occasions at the World Four-in-Hand Carriage Driving Championships. She is currently the World’s leading lady Four-in-Hand Carriage Driver. For funerals she provides a matching pair of Silesian or Friesian horses, which are trained to stand quietly and are extremely reliable in traffic. A team of four black horses, a pair/team of grey horses, or a pair/team of bay horses are available by special arrangement. The horses are turned out to a high standard in English leather harness with traditional collars. They wear black, white, or purple ostrich feather plumes and either black or white drapes. The Driver and Groom wear traditional Victorian livery. We have recently purchased another black replica hearse to compliment our original hearse to compliment our original hearses and can now also provide a white hearse. This is especially appropriate for a child’s funeral, or for those people who require a less sombre feeling. All the hearses will accommodate the large American-type coffins and have flower rails and traditional style carriage lamps. 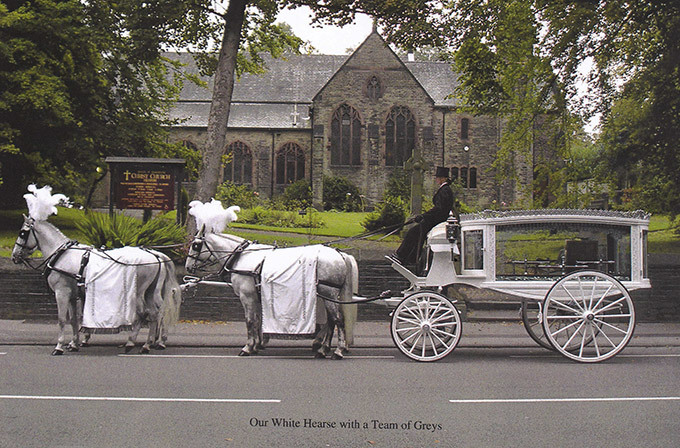 For that extra special touch, we can offer two liveried out-riders and Mourner’s carriages. Karen and her experienced team of drivers and grooms will provide a competent, reliable and trustworthy service, which re-creates the elegance of a bygone era. 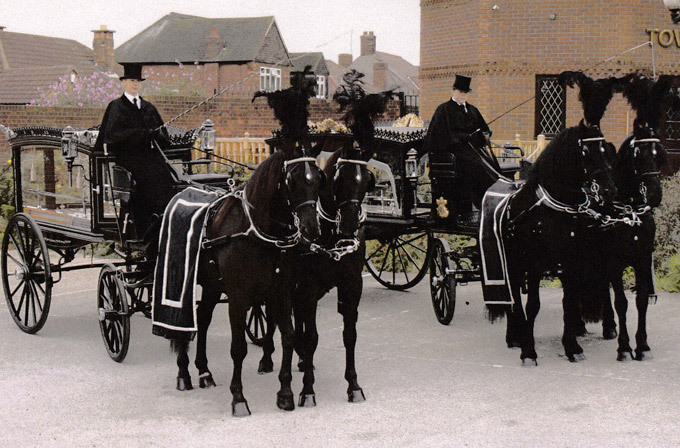 Although the horses are very fit, in the interests of their welfare, we would not expect a normal funeral cortege to exceed a distance of approximately 8 miles, with a duration of up to 2.5 hours. There may be an additional charge for funerals which require more time.